New machine replaces 255XT model and features digital meters and 40% duty cycle. Designed around Lincoln Electric's patented Diamond Core Technology that offers extreme arc stability regardless of position, the new Power Mig 256 welder is aimed at MIG and flux-core welding in light industrial fabrication and maintenance and repair work. The PM 256 is rated at 250 amps/ 26 volts at a 40% duty cycle, and its cast aluminum internal wire feed is capable of speeds ranging from 50 to 700 inches per minute. The 208/230 VAC input model includes a 115 VAC auxiliary receptacle for powering grinders, lights and other tools in the work area. Lincoln Electric's new Power Mig 256 is the latest in the company's lineup of Professional's Choice welders, replacing the previous Power Mig 255XT model. For set up, the PM 256's control panel features digital meters which read out pre-set voltage and wire feed speed, during welding, the meters read actual voltage. The 256 comes with Lincoln's new Magnum Pro 250L gun – on a 15-foot cable -- for mild steel, stainless steel or aluminum welding, and is spool-gun-ready. The case includes a Coil Claw cable management system and a top-mounted expendables parts tray to help in keeping the job site organized. The wire-drive system features dual-driven rollers for positive traction and regulated wire-feed-speed control and includes a 100% wire supporting split wire guide system to keep welding wire aligned. 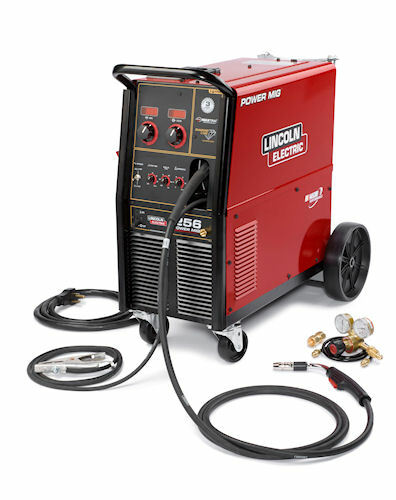 For more information on the new Power Mig 256, visit www.lincolnelectric.com.